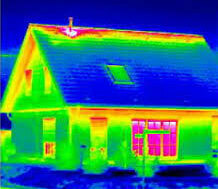 Western Infrared goes beyond the requirements for a home inspection. 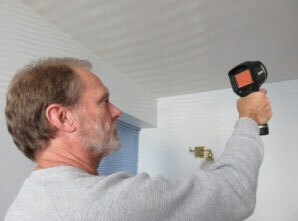 Besides the “Oregon Standards of Practice” that is required for home inspections in Oregon, our services include an infrared camera inspection of the house. This includes using the infrared camera to look for moisture intrusions inside walls, ceilings and in the attic. We qualify the moisture findings with a non-invasive moisture meter. We also look for heat or cooling losses through windows, doors, ceilings and walls. We will use the infrared camera to look for overheated wiring at outlets, switches and the electrical panel. We look for leaks in the air ducting and the heating and cooling units. Infrared camera inspections can also spot nests from animals, bees and other pests hiding in the walls. The infrared camera can locate missing or compromised insulation in the walls and ceilings. Our infrared camera takes two photos of the anomaly at the same time. One is the infrared thermograph photo and the other is a digital photo of the same area. Looking at both of these photos side by side it is much easier to locate the problem areas. Although not required our certified home inspector, Larry Tyler, will walk the roof to inspect the roofing, flashing, gutters and the chimney(s), if it is deemed safe to do so. 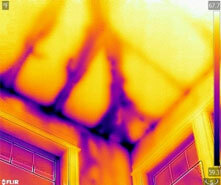 Infrared thermography is using a non-destructive diagnostic camera to find potential building and mechanical problems. In buildings and mechanical systems this includes water penetration, heat or cooling loss, blockages or leaks in plumbing systems, malfunctioning mechanical systems (motors, bearings, belts, heat pumps, etc. ), overloaded or loose electrical circuits, structural defects, and substandard building construction. In Home Inspections for home and building purchasers, home owners, co-op boards, condo associations, business owners and others, the main advantage of an infrared survey is that it gives a view of building conditions beyond what can be seen by eyes alone. Another advantage is that it is a non-destructive method of testing, so it does not disturb the area being investigated. When used on mechanical and electrical systems, it doesn’t interfere with equipment operation of equipment, so there’s no need for shutdowns. The infrared photos (radiographic thermographs) can be uploaded to our computers and reports be made with high resolution infrared pictures along with the digital photo of the same location for easier locating of the problem area. These infrared pictures in the Home Inspection report can have over 310,000 pixels with each pixel having a temperature associated with it. These high resolution thermographs can be manipulated by our technician to best highlight the problem areas. In our reports our certified thermographer, Larry Tyler, interprets the infrared photos and gives recommendations based on his 35+ years experience in the construction industry.